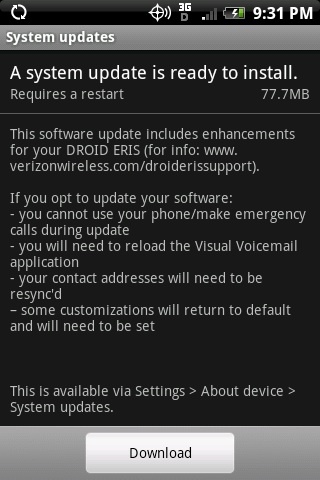 The HTC Droid Eris update has finally started rolling out to Verizon customers this past Sunday. A message from a Verizon Twitter account indicated that the update would become available yesterday. The Android 2.1 update is an Over the Air (OTA) update that you apply to your Eris without having to connect it to your computer. When the update becomes available for your Eris, an Update Available icon will appear at the top left of your screen. Once you download the update installer, you will be prompted to restart your phone and the update will be installed. 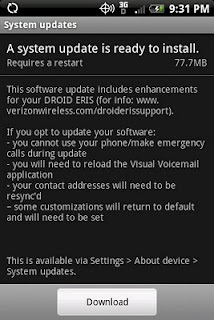 For more details about the Google Android 2.1 update for the HTC Droid Eris, check out the Verizon Wireless support website.